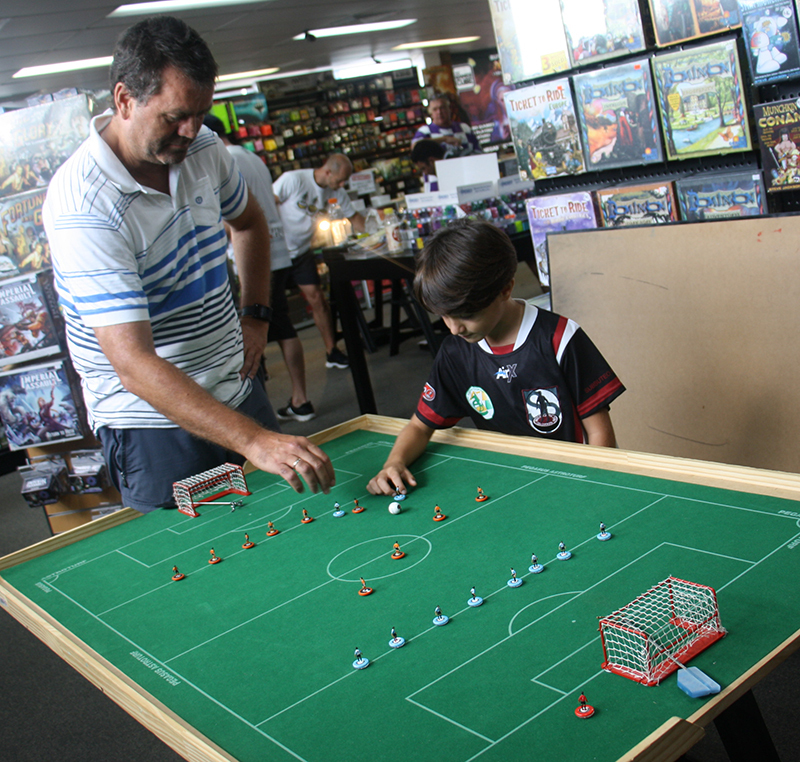 The Games Cube in Parramatta was heaving on Saturday, February 27. With more people turning up for a miniatures tournament than the owners had been counting on, the Subbuteo pitches got moved from their usual spot in the gaming area right into the middle of the shop floor. This was a great bonus, as the air-conditioning on the sweltering day was much better here, and the game was on clear display for everyone in the packed store to see. The Lombardi father and son duo had traveled up from Berry on the morning, Dave Sultana had thrown his wicket away at the end of play the previous Saturday and called in the 12th man for fielding duties so that he could be part of the Subbuteo action, while Eliot Kennedy returned from his sojourn to the US to resume his rivalry at the top of the Sydney Premier League table against Daniele Lombardi. The tournament was played in a 4 round Swiss System, with the first round drawn randomly. Harley Ullrich surprised Daniele after going down early, scoring an equaliser with a flying counterattack. Daniele was roused from his lethargy and ended with a hard earned 2-1 victory by full-time. Eliot dominated possession but had trouble getting through Adrian Elmer’s ‘keeper and found himself susceptible to the odd counter attack but was able to settle his nerves midway through the second half to take a 1-0 victory. Steve Dettre slipped 3 past Dave, while Mat conceded 2 to Raffaele Lombardi. Hermann lines up against Gabriel. Because not enough juniors were able to enter the tournament, 6 year old Gabriel Lombardi had to play in the main competition, where he performed very admirably, earning sporting draws against Hermann Kruse and Adrian. Raffaele put another 2 past Steve, while Dave’s defense improved considerably, keeping Mat to a hard won 1-0 scoreline. In the shock result of the day, Eliot shipped 3 goals against Daniele, their normal tight tussle nowhere to be seen, as Eliot continued to struggle in front of goal while Daniele found every shot was turning to gold. By the final round, Eliot needed to beat Raffaele by 2 clear goals and hope Adrian could hold Daniele at bay if he were to take the tournament title. Unfortunately for him, Daniele blitzed Adrian in their match opening and it was 3-0 before Adrian could even get a look in. 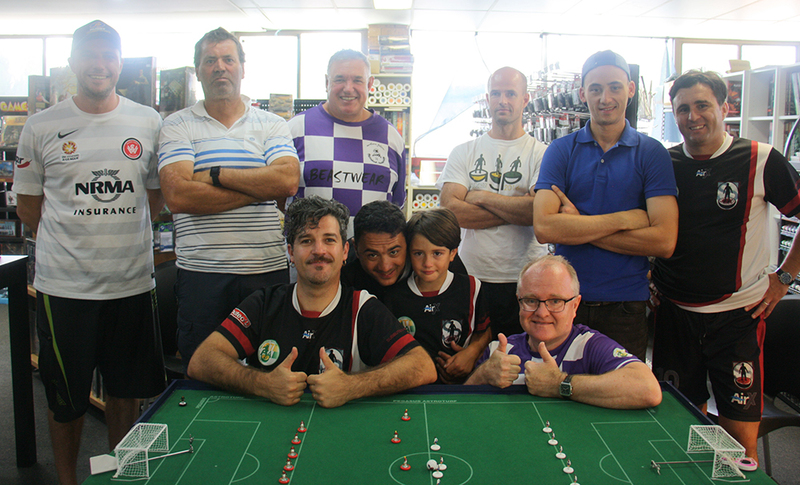 In the end, it mattered little as Raffaele held off Eliot with a 0-0 result that gave Raffaele his first Sydney Premier League title. 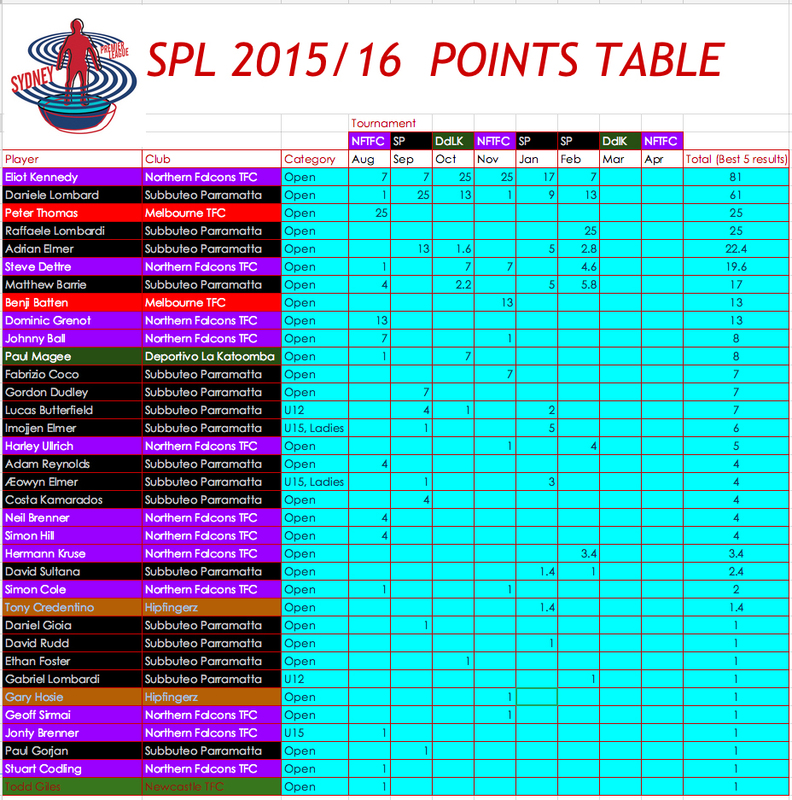 Meanwhile, in the lower placings, Hermann made a large jump on the table with a 1-0 win over Dave. Dave did manage to score his first goal of the day – a beautiful manoeuvre through a packed box with a shot on the run. Unfortunately, one of his figures was in an off-side position! Still, for only his second ever tournament he is showing signs that it won’t take long before he is a contender. A great day’s play with all competitors playing with great sportsmanship. A number of interested onlookers got an introduction to the game, including the owner of The Games Cube, Lindsay who, having supported us wonderfully for almost 2 years now, finally got to play his first game. And, most pleasingly for this organiser, the entire tournament ran exactly to schedule! Thanks all. 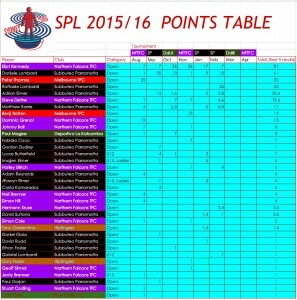 This entry was posted in Tournament reports and tagged subbuteo parramatta, sydney premier league, tournament report, waspa on 03/03/2016 by ajebec.